Yellow dots *roughly* outline the site, which is bound by N. Decatur Rd., Church St. and Milscott Dr.
Map via Google; click to enlarge. As most have heard by now, the site at the old Naley car dealership (Corner of North Decatur Rd. and Church Street) is being redeveloped. 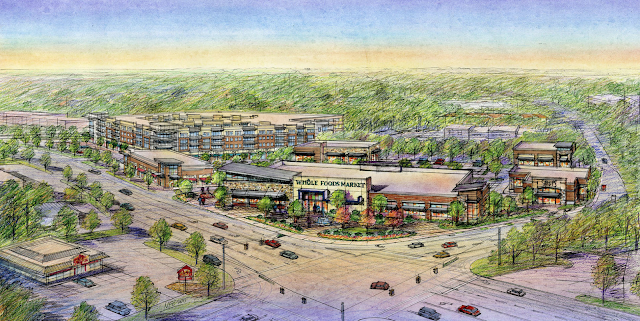 Whole Foods Market's interest in the site was announced last March, and this week we learned that the store will be in the new "365 by Whole Foods" format. The 18-acre development will also include restaurants, retail, greenspace and apartments. The 365 website lists the store's adress as 1609 Church St. Business Insider summarizes what to expect from this new concept. Both S.J. 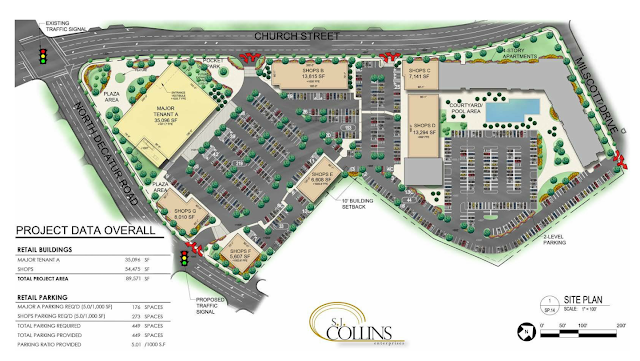 Collins Enterprises [the project's developer], and staff from Commissioner Barnes Sutton [the site is in District 4] have reached out to the DeKalb Cross-Neighborhoods Council. The Council wanted to update the community that a meeting is being scheduled for late May and details will be shared as soon as they become available. Update: Some views and more detailed plans, such as the views below, are now available at the developer's website.